+1: Draw a card. At the beginning of the next end step, untap two lands. −3: Put target nonland permanent into its owner's library third from the top. −8: You get an emblem with "Whenever you draw a card, exile target permanent an opponent controls." 4/27/2018 You don’t decide which two lands to untap until the next end step. 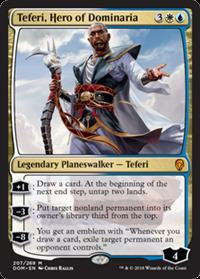 4/27/2018 You choose the target for the triggered ability of Teferi’s emblem after you’ve seen the card you drew.